Tiong-hui Kiōng-hô-kok (Hoat-gí: République Centrafricaine) tiàm-tī Hui-chiu ê loē-lio̍k kok-ka. Keh-piah kok pau-koah Chad, Sudan, Congo Bîn-chú Kiōng-hô-kok, Congo Kiōng-hô-kok, Cameroon. ↑ UN projection "World Population Prospects The 2012 Revision: Highlights and Advance Tables". The Department of Economic and Social Affairs of the United Nations. pp. 51–55. 11 August 2013 khòaⁿ--ê. 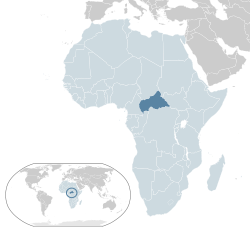 ↑ 3.0 3.1 "Central African Republic". International Monetary Fund. ↑ 4.0 4.1 "Central African Republic". International Monetary Fund. 1 October 2014 khòaⁿ--ê.
Chit ia̍h siāng bóe tī 2017-nî 12-goe̍h 3-ji̍t (Lé-pài), 08:03 ū pian-chi̍p--koè.